WheelTurnerHawaii.com: Hawaii Winter Outlaw Seires Event 1- The Hawaiian Ridge Rusher Write Up. 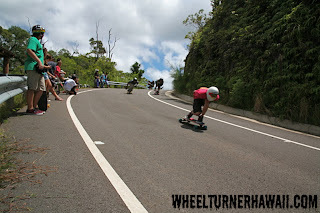 Hawaii Winter Outlaw Seires Event 1- The Hawaiian Ridge Rusher Write Up. 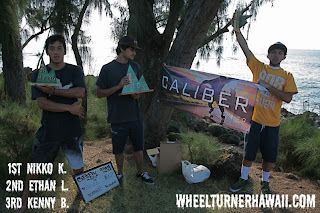 Here on Oahu, The Hawaii Winter Outlaw Series kicked off this past and boy are we off to a strong start. 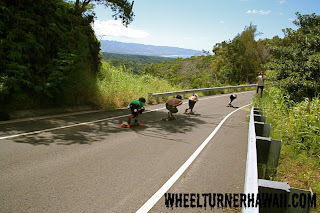 The Hawaiian Ridge Rusher was the first race of a six race series that will be taking place over the next half a year. 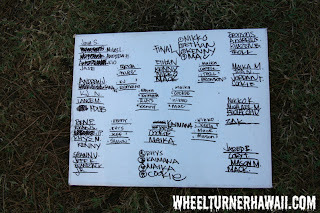 It was a beautiful sunny morning on the north shore and we had 35 racers signed up, stoked, ready to go. 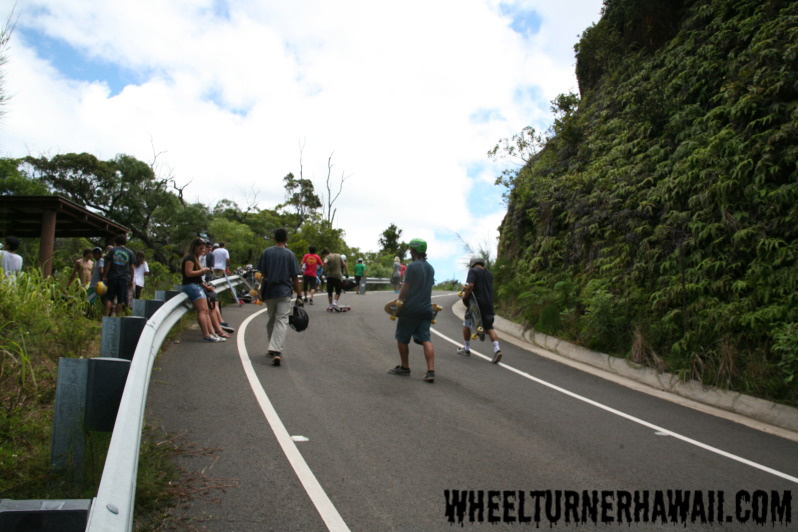 After having a brief last minute sign up and riders meeting, the skaters were told how to get to the race hill. The road was familiar to some but new to many… so there were several confused looks when told where to meet. 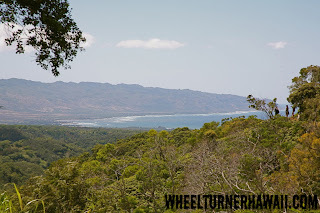 When everyone regrouped at the end of the paved road, we started our hike. The new comers were doubtful. 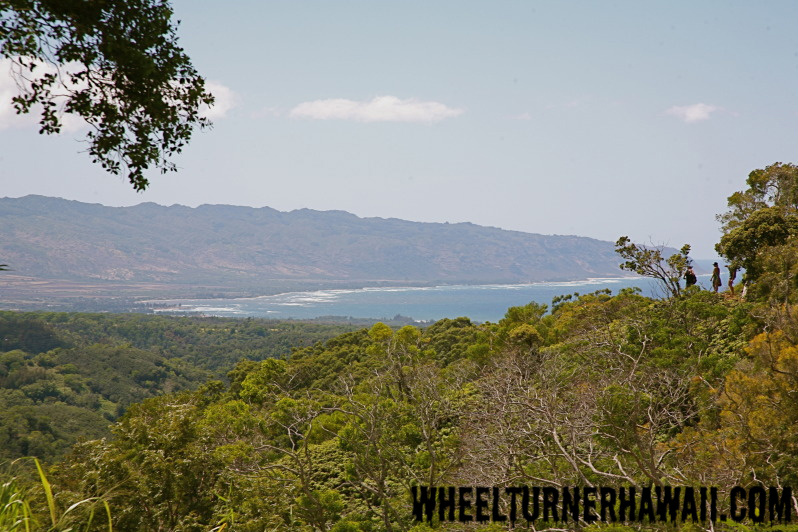 The vets were quickly jogging and riding the rough, dirt trail… But when the dirt turned to butter smooth pavement there wasn’t a doubt in anyone’s mind that this was the perfect venue to kick off the H.W.O.S. season. 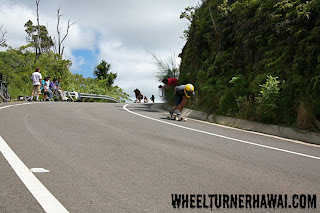 Everyone was given some time to get in some practice runs on the smooth, closed road. 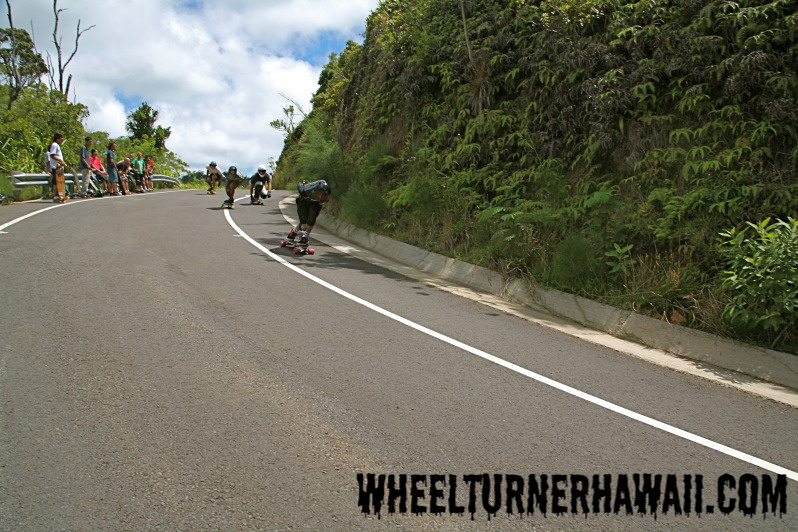 The course started with a steep straight dip followed by several sweepers, which took you through flats, uphills, and more dips that kept riders quickly moving the whole time. Every single racer was on their top game, holding their tucks and taking perfect lines on the hill from the first run of the day. Jase K. leading a practice heat. When everyone felt comfortable, riders were gathered into their set heats and sent up the hill to start round 1. There were 3 heats of 5 riders and 5 heats of 4, making 8 total heats in the first round. 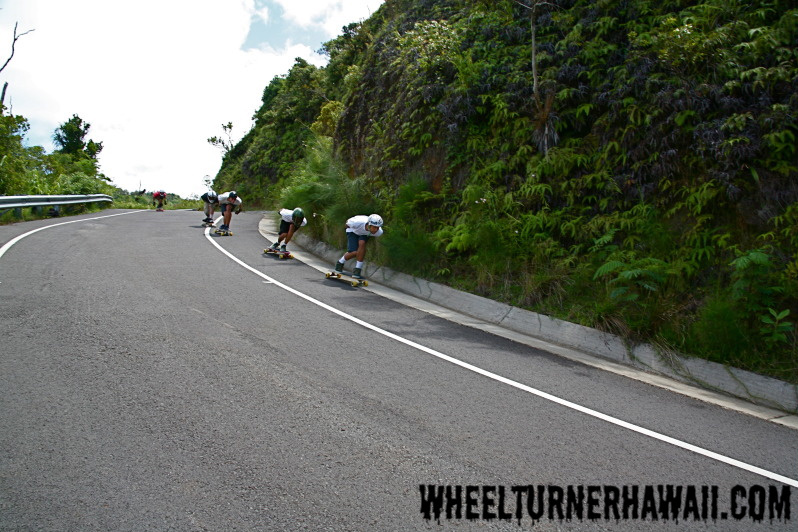 This event we had a limited push area, but we gave riders an option to start however they want. Racers lined up, and waited for the “ rock start” (a rock was thrown and once it touches the ground heat was started) to get heats going. Over all 2nd place racer Ethan Lau had no problems making it through the first round. Everyone looked fast and the racers were in close lines coming through all the turns. 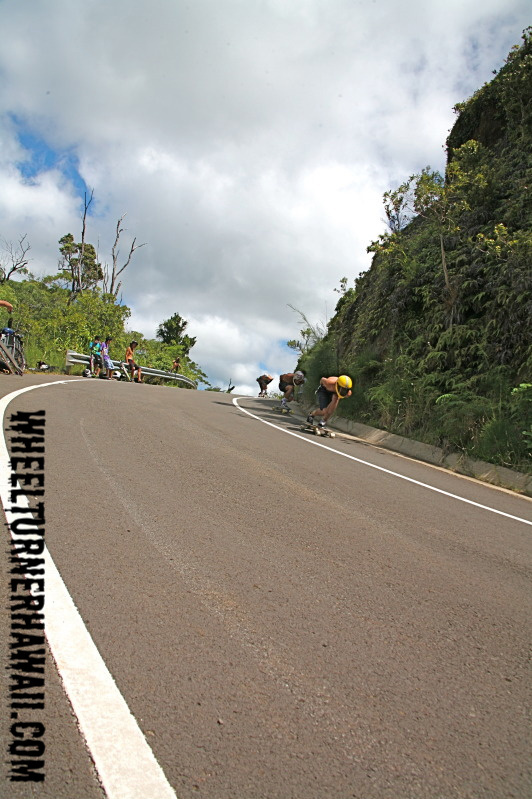 Though all the riders were on point, making it through the course quickly and safely…only the top 2 from heat moved onto the next round. Overall 4th place racer Mackenzie Yoshida leading the pack in the first round. Now we have our top 16 ( who get an automatic invite to event 2) which is our quarter finals. 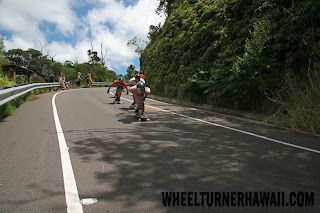 The heats are stacked with shredders, some repeat series racers but many first time HWOS competitors. Everyone was getting comfortable racing on the course so there was some fighting going on for the inside line through the turns. Racers battled it out in some close, fast, action packed heats, and the top 2 from every heat went onto the semi finals. Kenny Bergsrtom in front of the line. He ended up getting 3rd overall! These last two heats are some of Hawaii’s fastest skaters and it made for some good racing. The heats were full of passes and strategic moves all the way down to the finish line. Coming out on top of their heats, making it on to the finals was Nikko Kamanuwai, Ethan Lau, Kenny Bergstrom and Mackenzie Yoshida. 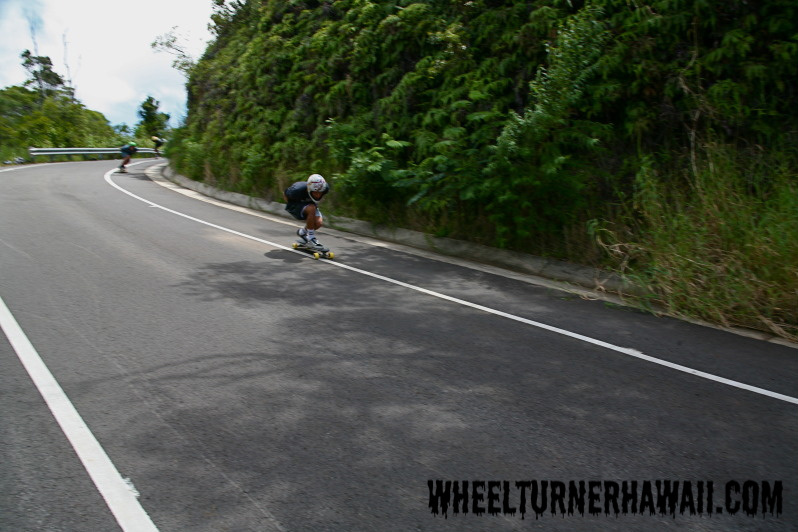 Overall 1st place racer Nikko Kamanuwai was looking flawless all day. The consi’s skated down racing for 5th – 8th while the racers in the finals got geared up. When everyone was ready, they got the ok to start and the rock was dropped. Nikko instantly ran out into first, closely followed by Ethan, then Kenny and Mackenzie. Coming down the first dip Nikko held his lead with Ethan on his tail as Kenny and Mackenzie spent time rubbing shoulders in the bends. When entering the turns the racers were in a tight line and it stayed this way till the finish. I almost want to say it was the only heat of the day with no passes! Tearing it up looking flawless all day taking 1st was Nikko kamanuwai who was closely followed by Ethan Lau. Kenny Bergstrom who is freshly back on board after being out for a few months from a accident took 3rd. Rounding out the top 4 was race organizer Mackenzie Yoshida. The battle for the win. We finished racing the consi bracket for full placing, hiked out, and headed to the beach for awards. The top 8 placing racers were awarded money… 1st place getting the big Caliber Truck Co. check, which was 10x their entry fee!!! 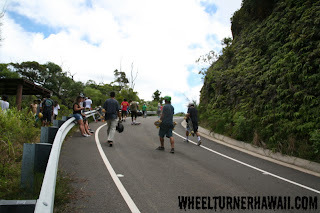 They also got some goodie bags that were full of all the gear they need to keep shredding. Nikko Kamanuwai receiving his check for $150 and a bunch of gear. 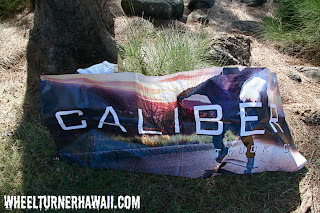 Caliber Truck Co was a huge help. Event 1 was a huge success and a great start to the series. The scene here has grown tremendously since last winter and will only continue to grow through out the season. 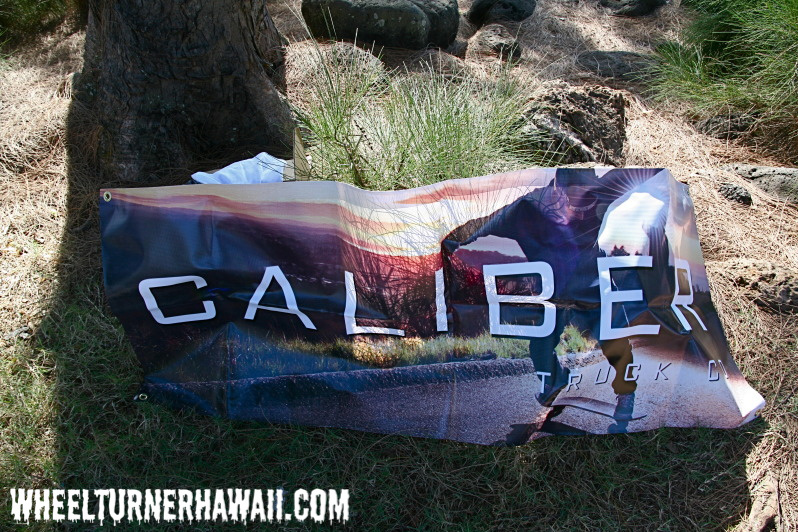 Mahalos to all of our sponsors for keeping the scene stoked. The Scorcher2 invitational is the next event and will be on October 15. The top 16 from this past event is automatically invited, but everyone else… hope you get contacted. 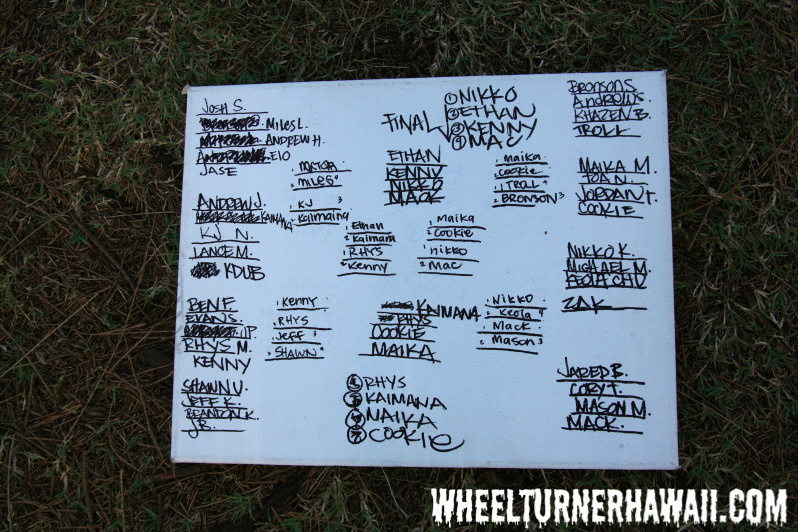 Thanks for making the start of the season a good one, hope to see everyone at event 2! sweet bra! looks like it was a successful event. nice trophies and cheques!